Welcome fellow Bear & Moose lovers, thanks for dropping by! Here you will find Bear and Moose Quilt Patterns with a North Woods flair. Our patterns feature a lovable bear named Cliffsbear with fun and adventurous spirit. Then there's our Moose named Matty, he's a playful guy who is sure to steal your heart away. So, sit back relax and grab a latte and enjoy your trip through the woods. 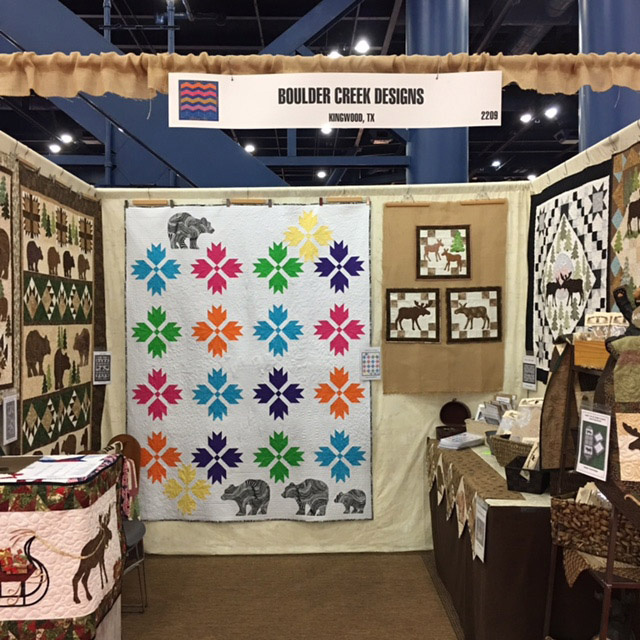 The photo above is from Fall Quilt Market featuring our new very large Bear Quilt called 'Cliffsbear Goes Mod'. To the right is 'The Moose Family Picture Day'. Fun little Quilt-lets for the Family photo wall.